Marie Spartali Stillman (1844–1927), The Childhood of Saint Cecily (1883), watercolour and graphite heightened by gouache, 101 x 74 cm, Private collection. Wikimedia Commons. Now unfortunately overshadowed by Impressionism, the Pre-Raphaelite movement was a major influence in European painting in the middle and later years of the 1800s. The core of the Pre-Raphaelite Brotherhood was small and transient, but the movement and its periphery spread further, and lasted until the early twentieth century. Like Impressionism, it was also notable for being one of the first art movements in Europe in which women artists became a major influence. 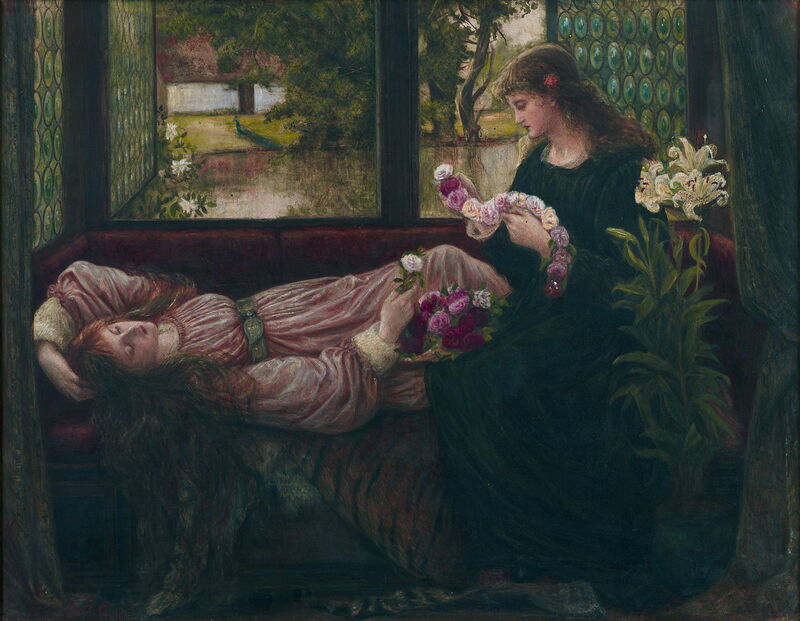 Today, the women of the Pre-Raphaelite movement are mainly known as models, lovers, and partners; at the time, several were productive and original painters in their own right, but somehow their work never got into major public collections, and is now generally overlooked. Of the women painters who were part of the movement, probably the most prolific and significant was Marie Spartali Stillman (1844–1927). She was born Marie Euphrosyne Spartali in Hornsey, Middlesex, to the west of London. Her parents were wealthy merchants; father, Michael Spartali (1818-1914), had moved to Britain as a boy, and his successful trading had enabled him to buy a large Georgian country house on Clapham Common, which was then in the country south of the city. Among his trades were objets d’arts and archaeological objects from the Middle East (some of which are now in the British Museum and others). He enjoyed the company of rising writers and artists, and held garden parties and dinners to cultivate them. His business connections resulted in being appointed Consul-General for Greece in London, a role which he held from 1866 to 1879. Unfortunately his business then went through a bad patch, and in 1885 he went bankrupt. He and his wife were able to retain much of their possessions, and he seems to have recovered quite quickly. Following that, Marie’s parents seem to have largely retired to live in one of the properties which they had used on the Isle of Wight as summer homes. In her late teens, Marie associated with her cousins Maria Zambaco and Aglaia Coronio, who became collectively called The Three Graces for their beauty and grace. In 1863, they became known to Whistler, Swinburne, and then members of the Pre-Raphaelite movement, and were frequently used as models for their paintings. In 1864, after chaperoning her sister when modelling for Whistler, she started as a pupil of Ford Madox Brown, and for two days each week he taught her in his studio. Julia Margaret Cameron (1815–1879), Marie Spartali Stillman (1868), albumen silver print from wet-collodion glass negative, The Art Institute of Chicago, Chicago, IL. Wikimedia Commons. Marie Spartali was first sent to the pioneer photographer Julia Margaret Cameron (1815–1879) at her father’s wish (and cost). 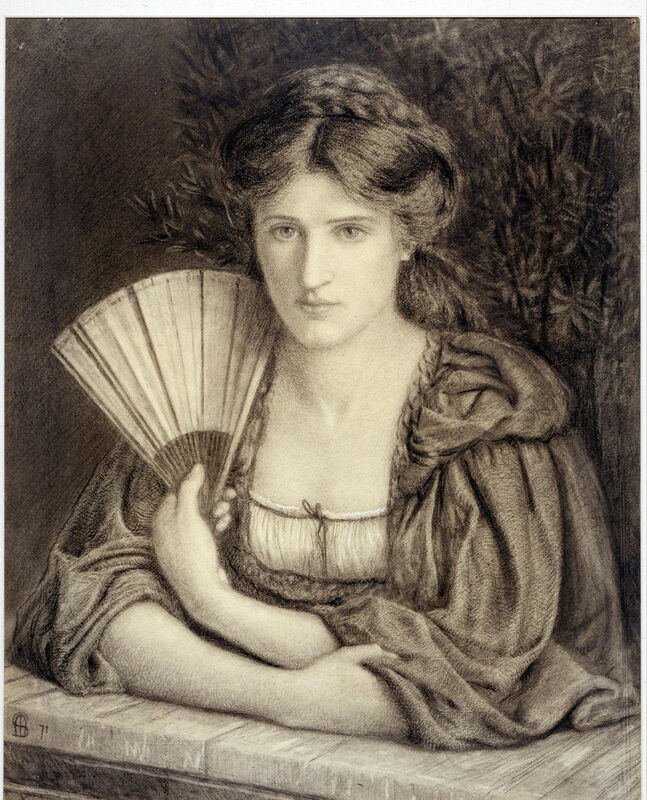 Cameron’s Marie Spartali Stillman (1868) is an example from that commissioned series. Later, Mrs Cameron put her in a variety of roles as a model, in her studio at Freshwater on the Isle of Wight, close by Alfred, Lord Tennyson’s winter residence there. Cameron was one of the earliest ‘artistic’ portrait photographers, specialising in women. 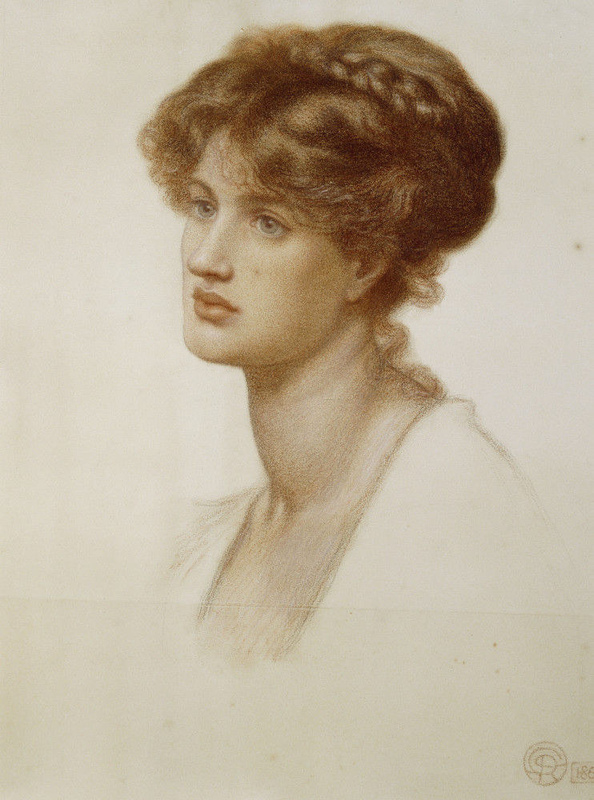 Dante Gabriel Rossetti (1828–1882), Marie Spartali Stillman (1869), red chalk on greenish paper, 62.2 × 47 cm, Private collection. Wikimedia Commons. The following year, Dante Gabriel Rossetti (1828–1882) sketched her in red chalk; Rossetti was among the core members of the original Pre-Raphaelite Brotherhood, and openly expressed his admiration of her beauty, and his inability to capture it in his work. He used her as a model for several of his paintings. 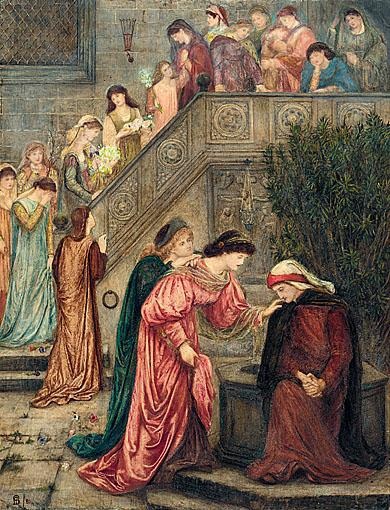 Mariana (1867) is a remarkably accomplished watercolour version of this popular motif, set here in the context of Shakespeare’s character in Measure for Measure, and Tennyson’s poem of 1830. In the former, Mariana is a betrothed woman who, when rejected by her suitor, lives in a moated house. In the latter, the rejected and world-weary woman becomes suicidal. Despite a favourable reception when shown in the Dudley Gallery, Marie kept the painting, and it did not re-appear until the 1980s. 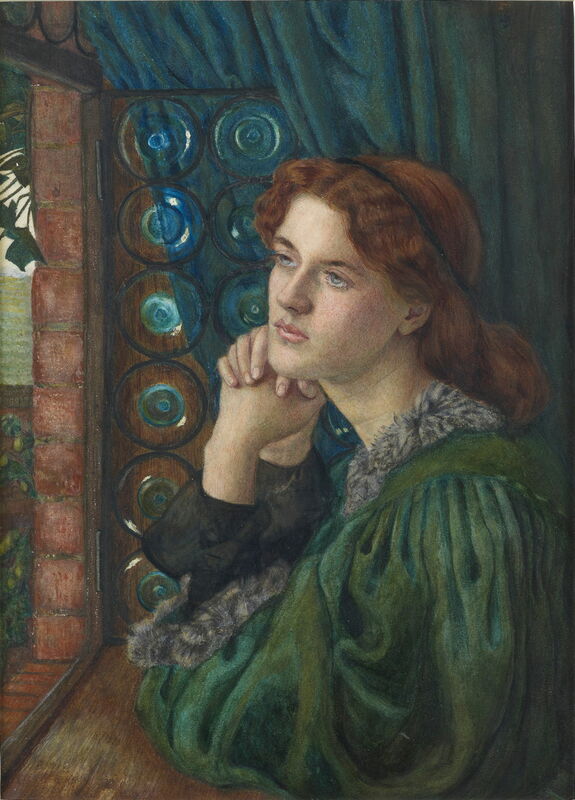 It was probably an inspiration for Dante Gabriel Rossetti’s Mariana of 1868-70. She first exhibited five watercolours in the Dudley Gallery in 1867. That gallery had only opened in 1865, to specialise in works on paper. Shortly afterwards, she met and fell in love with the American journalist and minor painter William J Stillman, who had just returned from supporting the Cretan rebels in their uprising on Crete. He had recently lost his wife, and had three children from that marriage. In 1870, Marie exhibited for the first time at the Royal Academy in London. Marie Spartali Stillman (1844–1927), Farm Scene (date not known), watercolor on paper, 30.8 × 44.5 cm, Delaware Art Museum, Wilmington, DE. Wikimedia Commons. It seems probable that her undated Farm Scene was painted when she was on the Isle of Wight one summer, perhaps fairly early in her career, when she made a number of such landscapes. It appears inappropriately titled though: it depicts a small thatched cottage on a public road (the signpost at the right), of which there were innumerable examples around Shanklin and Godshill at the time. Many have been preserved, and still carry a full thatch. There is some form of narrative taking place between the two adult figures, while a young girl shrugs her shoulders at some geese. Marie Spartali Stillman (1844–1927), Self-Portrait (1871), charcoal and white chalk on paper, 64.5 × 52.4 cm, Delaware Art Museum, Wilmington, DE. Wikimedia Commons. Her Self-Portrait (1871) was a study in charcoal and white chalk which she turned into a watercolour painting in 1874 and exhibited in Boston later that year. It is fascinating for including elements of both the Pre-Raphaelite in terms of her mediaeval costume and Renaissance treatment, and the Aesthetic in the Japanese fan. Although opposed by her father, in 1871 Marie and William married in Chelsea Register Office, London, following which they celebrated their wedding breakfast in Ford Madox Brown’s house. They spent six weeks of the summer in New York and Boston, where William was reunited with his children. The following year, their first child, Euphrosyne (‘Effie’) was born, and her parents welcomed them into a small cottage near the family home on Clapham Common. Her husband had difficulty in obtaining work, and Marie had to run the household and bring up their family; in spite of those heavy demands on her time, she maintained her painting output. In 1872, Marie paid her first visit to Kelmscott Manor, near Lechlade in Gloucestershire, England, where William Morris and Dante Gabriel Rossetti were driving forward the new derivatives from the original Pre-Raphaelite Brotherhood, including the Arts and Crafts movement. Marie remained good friends with the Morrises and Rossettis thereafter. Having laid the groundwork in their working honeymoon, in 1873 Marie had her first paintings shown in a Boston, MA, gallery. She maintained a presence in the US from then until close to her death. In 1876, William Stillman was employed by The Times newspaper as its correspondent in the Balkans, and he left London to work there, increasing the household demands on Marie. She had another important success at the Royal Academy that year, in the exhibition of a painting, The Last Sight of Fiammetta, which has subsequently been lost. That same painting was exhibited (alongside paintings by Burne-Jones and others) at the Exposition Universelle in Paris in 1878. In 1877 she was one of the 64 artists invited to inaugurate the Grosvenor Gallery in London, as an alternative to the Royal Academy. William Stillman moved with his work, and in the spring of 1878, the family moved to Florence, which he used as a more central base for his journalistic work. Later that year, their son Michael (‘Mico’) was born. Marie Spartali Stillman (1844–1927), Fiammetta Singing (1879), watercolor, gouache and graphite on paper, 74.6 × 100.3 cm, Private collection. Wikimedia Commons. 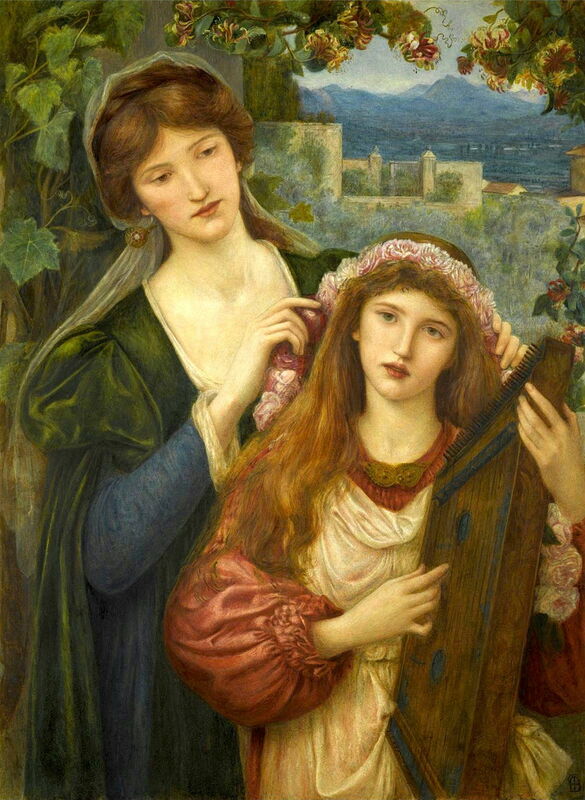 Fiammetta Singing (1879) was the second painting that she made based on Boccaccio’s poetry, here the sonnet Of Fiammetta Singing, probably using Dante Gabriel Rossetti’s verse translation. Her third tribute to Boccaccio was By a Clear Well, Within a Little Field (1883), below. It demonstrates the rapid effects which exposure to northern Italian art were to have on her work. Fiammetta, in red at the left, sings to the accompaniment of a lute, and with six other women in support (one of whom rests to the left of Fiammetta, with her lute). Boccaccio is seen to the right, behind, his ship waiting for him in the distance. Fiammetta carries a fan of peacock feathers, more typical of the likes of Whistler and Oscar Wilde, but the whole painting merges multiple artistic modalities – music, visual art, poetry – which is characteristic of the Aesthetics. While they were based in Florence, Marie returned each summer with her children to her parents’ residence on the Isle of Wight. This also enabled her to keep in touch with her British friends, and the London art scene. 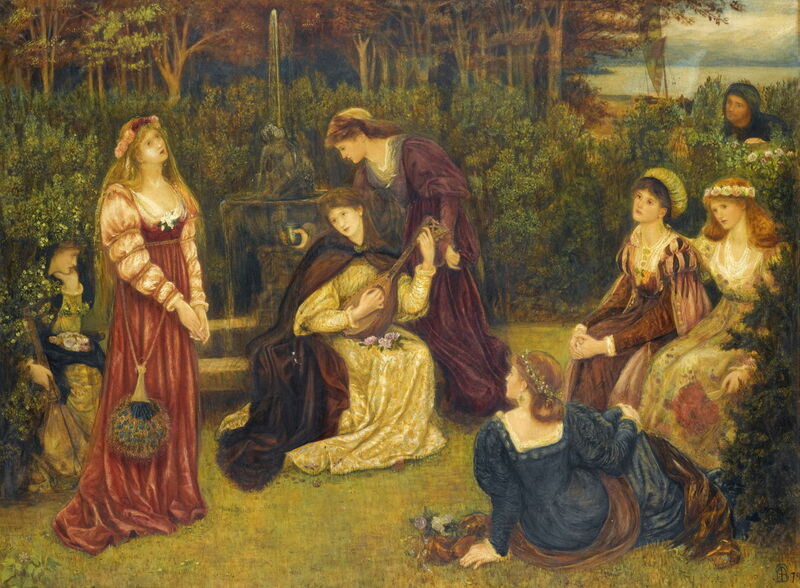 Marie Spartali Stillman (1844–1927), “Certain ladies of her companionship gathered themselves unto Beatrice…” (1880), watercolour and gouache over traces of graphite on paper on backing, 85.1 x 63.5 cm, Private collection. Wikimedia Commons. Certain ladies of her companionship gathered themselves unto Beatrice where she kept alone in weeping. And as they passed in and out, I would hear them speak concerning her, how she wept. This refers to the ladies of Florence who paid their respects to Beatrice as she kept vigil following her father’s death. Dante is shown sat outside the house, wearing his customary chaperon hat, his head bowed, and being comforted by two of the women who had visited Beatrice inside. This was shown at the Grosvenor Gallery in 1880. Marie Spartali Stillman (1844–1927), A Wreath of Roses (A Crown of Roses) (1880), watercolour and gouache on paper, 53 × 69 cm, Private collection. Wikimedia Commons. 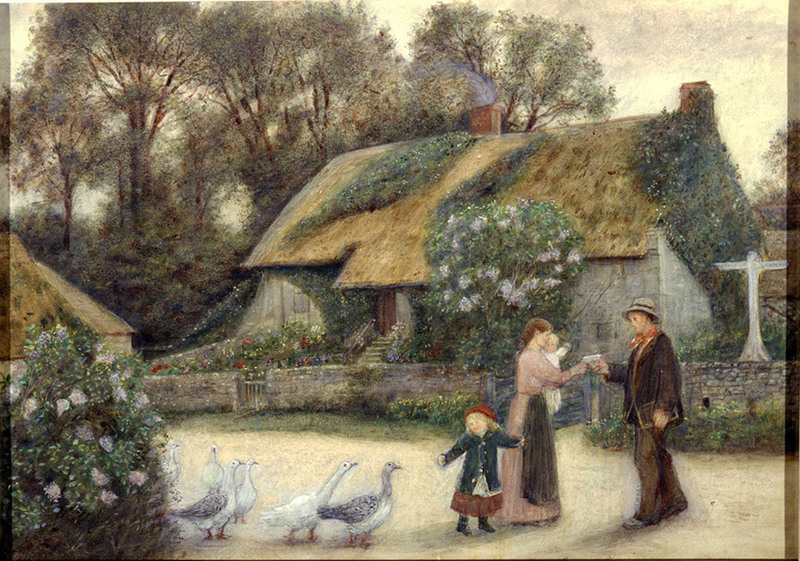 In contrast to the Italianate settings of the previous two paintings, her A Wreath of Roses (1880) is very English, and may have mainly been painted during the previous year, when she was in England for most of the year, and stayed for the summer at her parents’ house in Shanklin, Isle of Wight. It is likely that her two step-daughters, Lisa (then 15) and Bella (12) acted as models. The view through the bottle-glass window has been extensively modified, though: the house has diamond-pane leaded windows, not bottle-glass, neither does it have a moat. She also returned, to Clapham Common, for the birth of their third child in 1881, who sadly died the following spring in Florence. Edward Burne-Jones (1833–1898) & Marie Spartali Stillman (1844–1927), The Mill (1882), oil on canvas, 91 × 197 cm, The Victoria & Albert Museum, London. Wikimedia Commons. Marie undoubtedly modelled for this painting, and appears to have assisted Edward Burne-Jones (1833–1898) in the making of The Mill (1882) in oils. The three dancers were modelled by the Three Graces: Maria Zambaco, Marie Spartali Stillman, and Aglaia Coronio (from left to right). The Childhood of Saint Cecily (1883) was one of the last paintings which she composed when in Florence, which is reflected in its idealised Tuscan background. As with so many paintings of saints, it departs from even the most inventive of hagiographies, here for the patron saint of music, Cecilia. The saint is shown playing a harp-like psaltery, while an angel adjusts the garland on her head. It was shown at the Grosvenor Gallery in 1883, but did not receive favourable review. In the autumn of 1883, the family moved back to London, where she developed her friendship with the young John Singer Sargent. 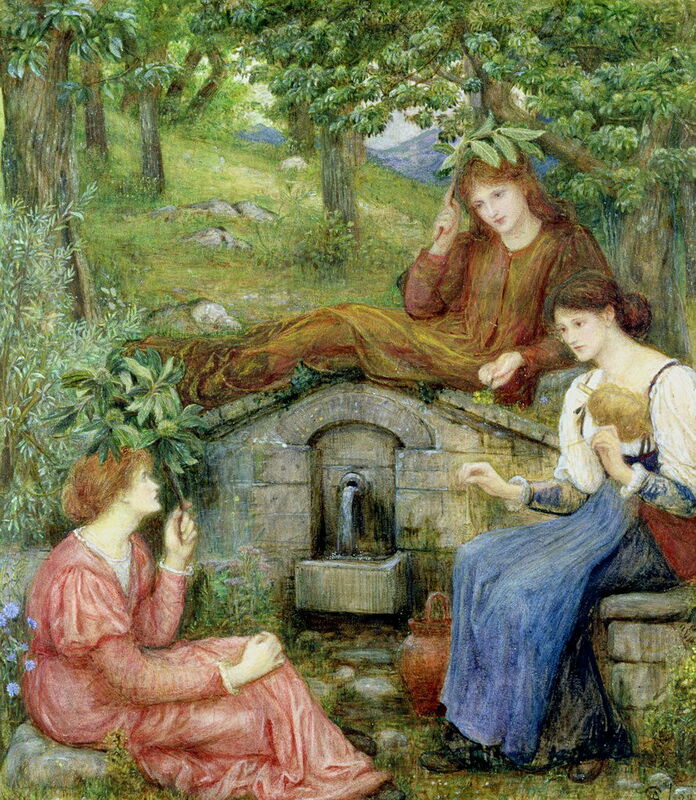 Marie Spartali Stillman (1844–1927), By a Clear Well, Within a Little Field (1883), further details not known. Wikimedia Commons. By a Clear Well, Within a Little Field (1883) is her third and concluding painting based on Boccaccio’s sonnets. That tells of three young women seated “by a clear well, within a little field” who relate their loves. Each has “twined” a small tree branch to shield her face, and put their golden hair in shadow. The woman at the right is spinning, and it is tempting to suggest that the trio might represent the three Fates. But the absence of their other attributes – particularly scissors or shears – makes that most unlikely. The other two women are covering their heads with small branches from the chestnut tree, as described in the sonnet. Its landscape is neither overtly Tuscan, nor recognisably British, and the well and trees could be almost anywhere in western Europe. It was exhibited at the Grosvenor Gallery in 1884. The next article will resume her story in 1884. Posted in General, Painting and tagged Brown, Burne-Jones, Cameron, history of painting, Isle of Wight, Morris, painting, Pre-Raphaelite, Rossetti, Spartali, Stillman, women in art. Bookmark the permalink. Great to read about this talented female Pre-Raphaelite, so interesting ! I am still working on a final part, which examines her time and paintings on the Isle of Wight (where I live). Where is your evidence that she also worked on the piece. I am studying her for my thesis and all of the sources I have read only mention her as a model. It is 18 months since I wrote this article, and I cannot recall where that was stated. I’m not sure that I believe it, hence I couch it with the word “appears”. If I remember the source, it referred to her learning to paint in oils with Burne-Jones and stating that she assisted him in the painting of that work, as she was modelling for it. I don’t recall whether that source provided any link to documentary evidence, though. As you know there are many rumours and unsourced claims about them both. You will have particular problems, I suspect, in obtaining information about her paintings and life on the Isle of Wight. As I live on the Isle of Wight only a couple of miles from two of the former Spartali properties here, and know the alleged locations of her paintings here, I would be very happy to provide more substantial evidence on those should you wish. I wish you success with your thesis and would be very interested to read it when you have submitted. the above comment is about The Mill. And by the time painted had begun in 1870 and finished in 1882 he no longer associated with the Pre-Raphaelite style, he was part of the Aestheticism movement. Yes, I cover Aestheticism in several other articles here. It’s a rather more nebulous movement, and far less documented in painting at least.